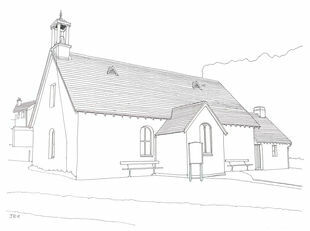 Torosay & Kinlochspelve church was built in 1783 with repairs and alteration in 1828, 1832. The entrance porch was added in 1967 and the kitchen was added to the vestry in 1982. The church is a plain Georgian kirk with white harled walls, Two external staircases to the lofts, arch-headed windows and a slate roof with a bird-cage belfry atop the east gable. The interior is simple but dignified with pitch-pine pews, pulpit and communion table and plain white walls. There are two galleries at the east and west ends. The building has a warm and loving feeling. The Roman Catholic Church conducts its service at 3.00 pm in the summer months and 5.00 pm in the winter. Contact Torosay & Kinlochspelve Parish Church.